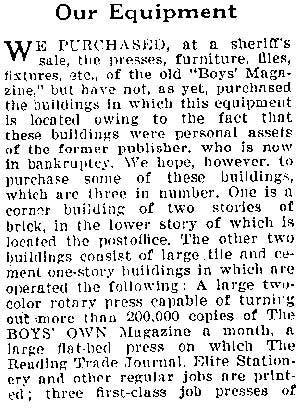 1926: Boys' Own Magazine Formed. Collasped Boy's Magazine Becomes Boy's Own Magazine! 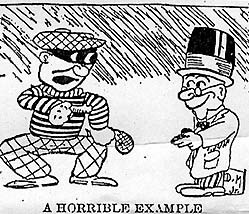 1926: Boys' Magazine Morphs Into Boys' Own Magazine. At the Sheriff's office sale, Mr. Hungerford bought all of the former equipment, furniture, and files. He later purchased the buildings that housed the former magazine. On November 6, 1925, a company was organized and incorporated to use the printing presses. The presses were so good that they could put out around 200,000 copies each month. Two offices were used by the company. 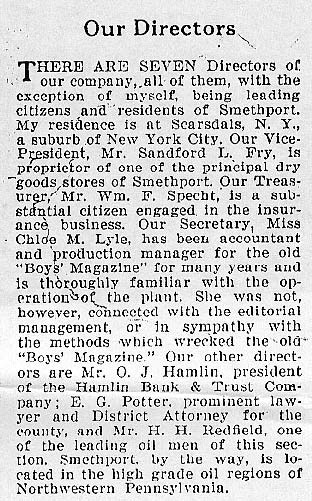 The first of the offices was based in Smethport, where the presses and buildings were located. The other office was the editorial and advertising office located just a few blocks from Broadway in New York City. The company owned and distributed about $150,000 dollars worth of stock to interested investors and persons that ordered subscriptions to the magazine. The company had seven directors. President- Mr. Sanford L. Fry, Treasurer- Mr. William F. Specht, Secretary- Miss Chloe M. Lyle, Mr. O. J. Hamlin, Mr. E. G. Potter, Mr. H. H. Redfield, and of course Mr. Herbert Hungerford,who was the President of Hungerford Publications. Jim and Sylvia Herzog Collection.